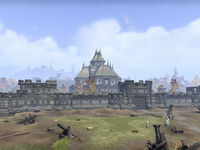 Fort Glademist is a keep in northwestern Cyrodiil, northwest of the Imperial City. It is initially controlled by the Daggerfall Covenant. It is connected via the Transitus Network to Fort Ash and Fort Aleswell. Only the Covenant can use the other two Transitus links to Fort Rayles and Fort Warden. It is an essential hub between the Daggerfall Border Keeps and the ring of keeps around the Imperial City. Glademist must be captured in order to gain access to the Covenant's Scroll Temples. Fort Glademist is gone by the time of Oblivion, but a cave nearby bears the name Glademist Cave. This page was last modified on 19 November 2018, at 05:33.